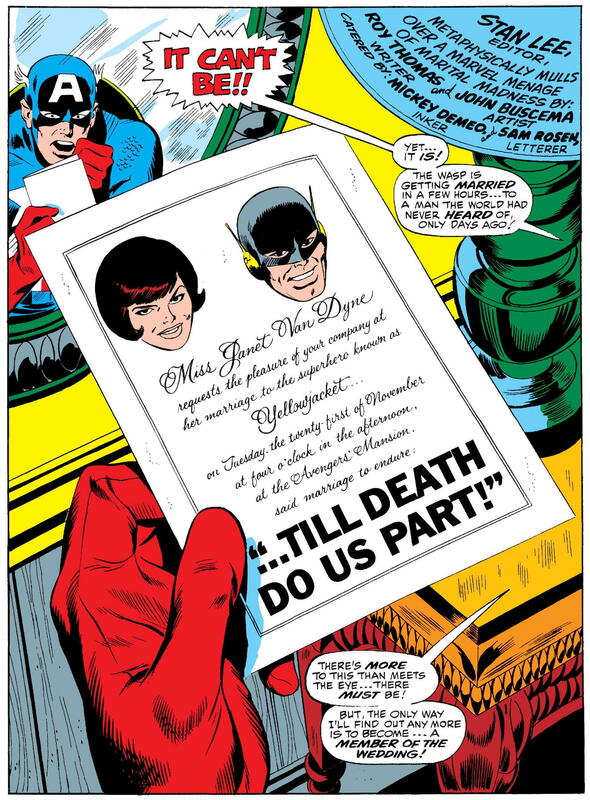 And then, there’s Avengers #60, featuring “‘Til Death Do Us Part!”, by Roy Thomas (writer), John Buscema (penciler), and Mike Esposito (inker, as “Micky Demeo”) — which not only gives us an Avengers Mansion-ful of super-powered guests and gatecrashers, but also brings the wacky on a level rarely seen before or since. 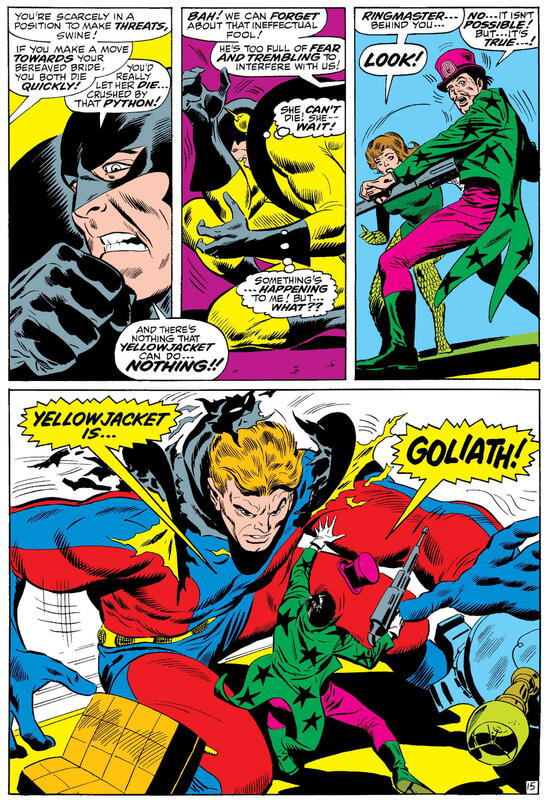 The smug Yellowjacket goes on to inform the indignant Avengers that they should forget about Goliath ever showing up — because he’s killed the size-changing Avenger! 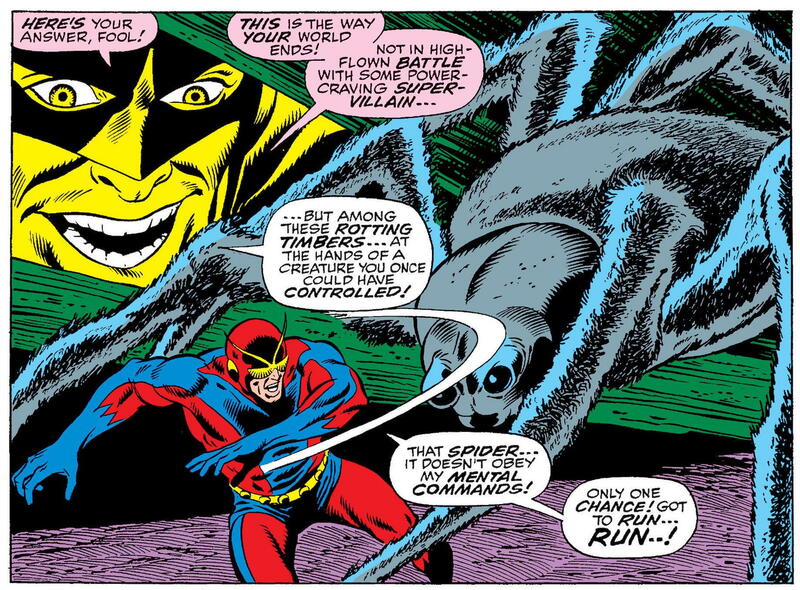 Yellowjacket didn’t actually see Goliath die, he says, but he figures there’s no way he could have escaped the spider. Uncertain whether or not to believe his tale, the Avengers figure their best option is to beat the truth out of him, and rush to attack. But before they can overpower him, YJ manages to take the Wasp hostage, and thus makes his escape. “Now I don’t want him to…!” Ewww. 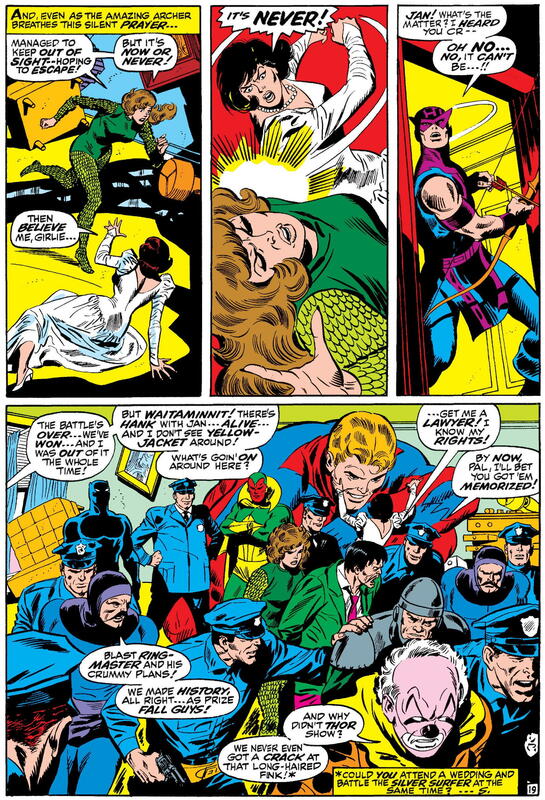 We open on a scene of a shocked Captain America receiving his wedding invitation, which seems an entirely appropriate way to begin. Cap, after all, has known Janet (and Hank) longer than any of their fellow current Avengers, as well as having led the team through a thirty-two issue run that had ended only about a year ago. 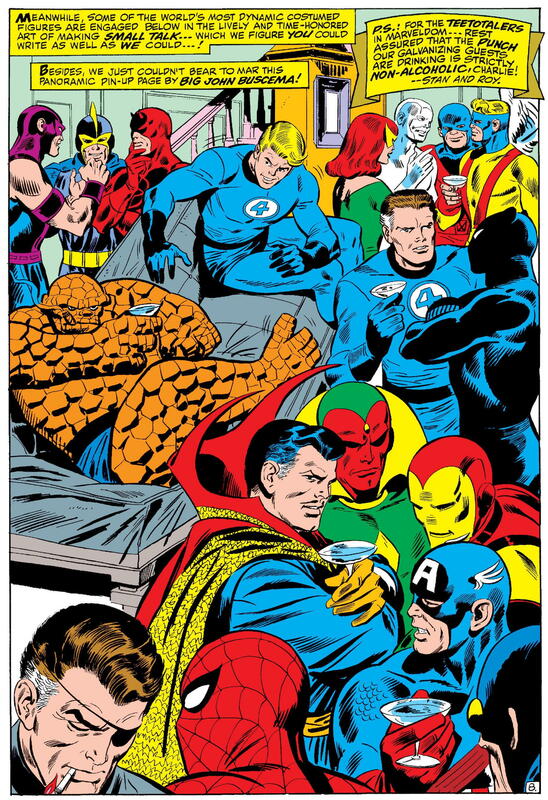 And as I’ve mentioned in several previous posts, although editor Stan Lee had told writer Roy Thomas he couldn’t use Iron Man, Thor, or Cap as “regular” Avengers members, Thomas worked them in as “guest stars” every chance he could — especially Cap, who was around so much that a relatively new reader (as my eleven year old self still was, in November, 1968) might reasonably wonder if he really had left the book, after all. I mean, Cap is even included as one of the four “floating Avenger heads” on this issue’s cover, fergoshsakes. 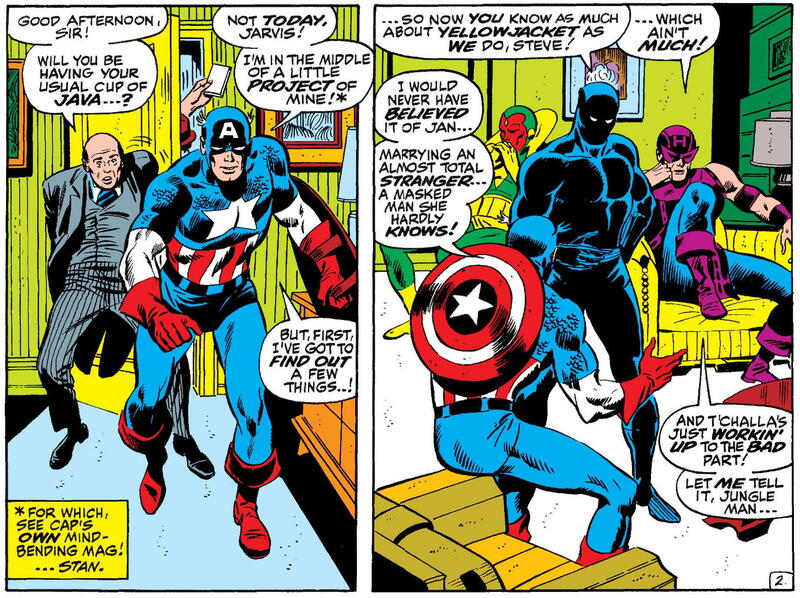 Based on the editor’s footnote, one must assume that the “project” that Cap refers to above is his taking on Rick Jones as his new partner, as seen in the pages of Captain America #110 [and discussed in last week’s blog post]. 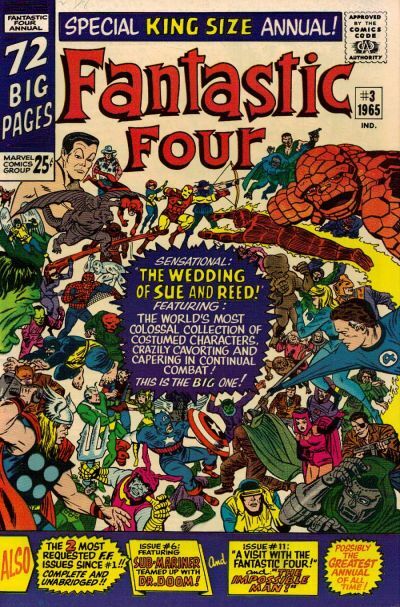 Oddly, however, in that issue, Cap — and Rick — are both plainly shown to be living at Avengers Mansion, so it doesn’t make much sense either for Cap to have received his wedding invitation somewhere else, or for the mansion’s butler Jarvis not to know anything about his “project”. Oh, well. 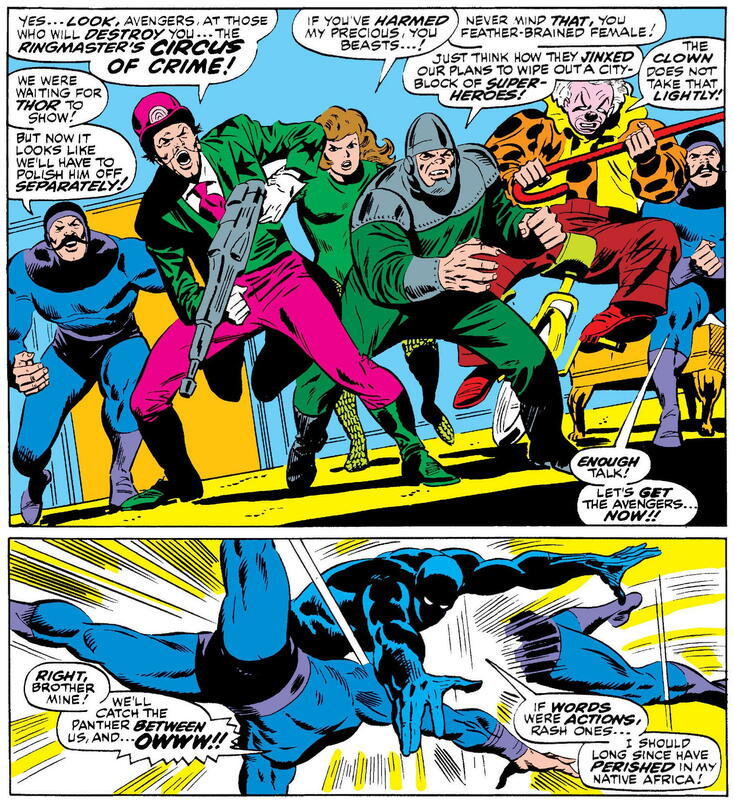 This group of super(ish) villains were completely unknown to me as a relative Marvel newbie in 1968, but longtime readers would recognize them as a B-list band of baddies who’d been around since 1962 (though they were likely inspired by an earlier Ringmaster & co. who’d appeared in Captain America Comics #5 [August, 1941]). Debuting in Incredible Hulk #3, they’d bounced from there to Amazing Spider-Man to Avengers to Thor, never really becoming established as any one particular hero’s nemeses. Their plan in this story is aimed mostly at getting revenge on the God of Thunder for a recent defeat at his hands — and involves blowing up the Avengers and all their superheroic guests with nitroglycerine. 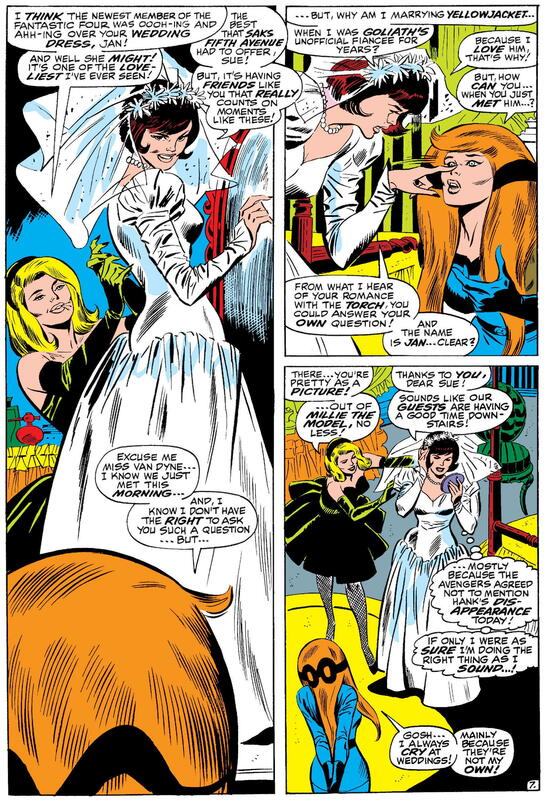 “Gosh” doesn’t sound quite right coming from the mouth of Crystal, a member of the Royal Family of the Inhumans, whose speech patterns tended to be considerably more formal in Stan Lee’s Fantastic Four scripts. Like the earlier bit concerning Captain America’s living arrangements, it’s an example of how difficult it was to keep Marvel’s fictional continuity 100% consistent across the line once Lee wasn’t writing everything. Still, it’s a minor inconsistency, and one that probably barely registered (if it did at all) on my eleven-year-old self back in ’68. And hey, the Marvel Universe was still a whole lot more coherent than its equivalent at DC Comics, where each editor still pretty much managed the characters and storylines in their own books with little to no regard for what their peers were doing. I can well remember being completely knocked out by this page the first time I saw it — a full-page splash that featured almost every superhero who were appearing in Marvel’s comics at the time. ** I specifically recall being fascinated by the different character groupings (why is Cyclops separate from all the other X-Men?) as well as being vaguely reassured by the fact that Spider-Man was present, considering that he was wanted by the police over in his own book around this time. At least his fellow heroes still know he’s a good guy! On the other hand, I don’t recall paying much (if any) attention to the caption explaining that our heroes are all drinking non-alcoholic punch — my own family were strict teetotalers, and we never had alcohol in our house when I was growing up, so that didn’t strike me as being in any way strange — but it does seem a little odd today, especially since there’s no similar statement explaining that Nick Fury is smoking a herbal cigarette (or Ben Grimm an herbal stogie). Alcohol is bad, but tobacco is OK? Those were different times, I guess. Wait, Cap and Iron Man have both bailed before the actual ceremony? That’s especially surprising in Cap’s case, considering that the book opened using him as a primary viewpoint character (plus, y’know, that floating head on the cover) — but I suppose writer Thomas didn’t want to press his luck with editor Lee. 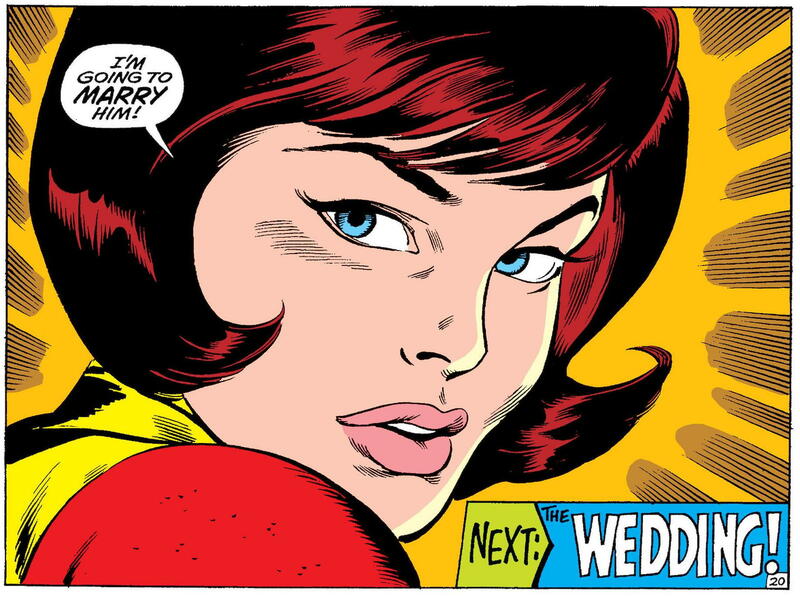 As soon as the ceremony is over, Hawkeye stalks off, wanting to put some distance between himself and Yellowjacket. He heads for the kitchens, to see how the wedding cake is coming along — and runs right into the Ringmaster and the Circus of Crime. 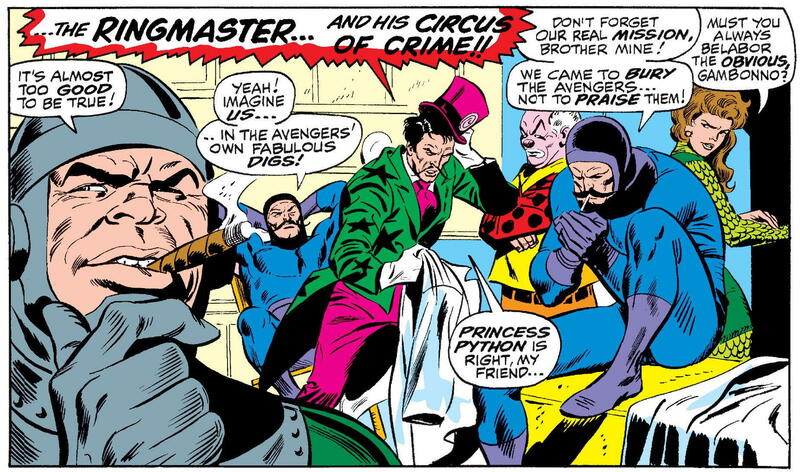 By dint of surprise (although, really, no one who was around for the Richards-Storm wedding should be surprised to find super-villains horning in on this one, too), as well as superior numbers, the bowman is quickly outnumbered; and soon, he joins Jarvis as a captive. Oh, right, that’s definitely the way to go. 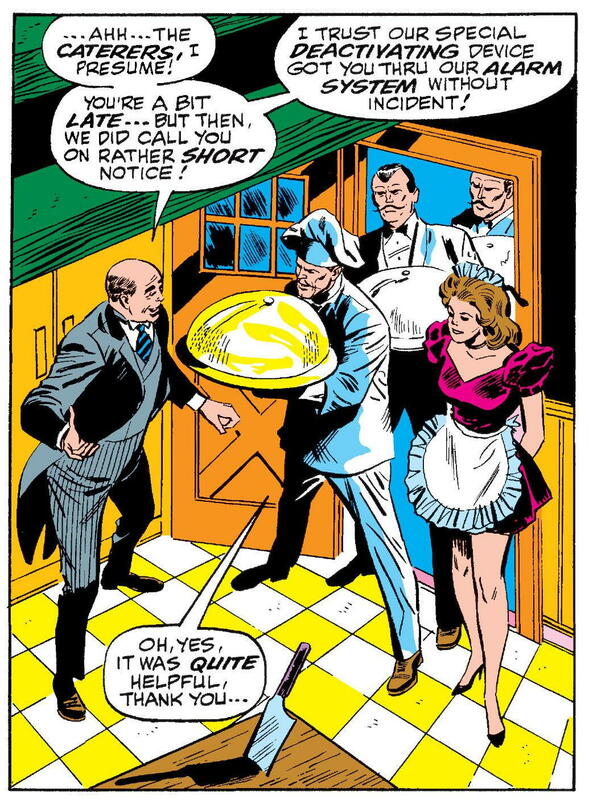 Send Daredevil and the FF and everyone else home, because “this is Avenger business!” What the heck does that even mean? The real reason for doing this, of course, is so that the fight that begins on the very next page won’t already be over by the end of that page. 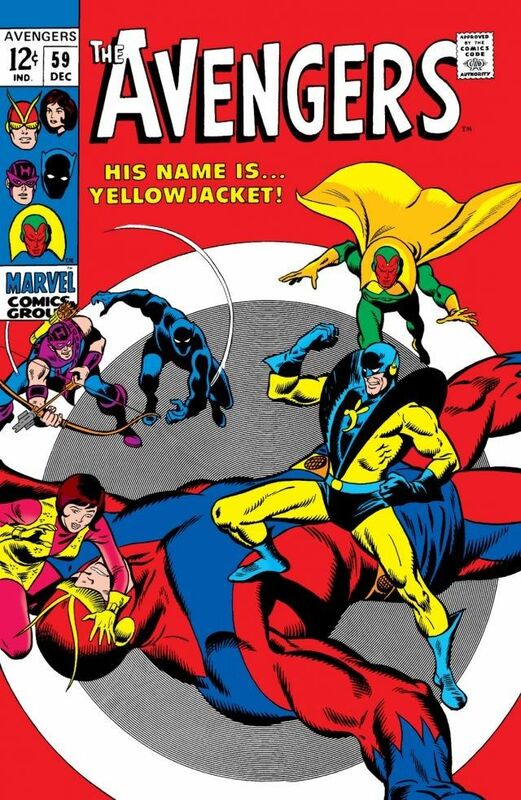 Honestly, I can’t remember whether I was taken completely by surprise fifty years ago by the revelation that Yellowjacket had been Henry Pym all along — but I kind of suspect that I was. I am sure that I’d finished issue #59 with no idea that the story YJ had told the Avengers about his battle with Goliath was a complete fantasy, though of course I didn’t believe that Hank was actually dead. I think, rather, that I accounted for Jan’s strange behavior by assuming she was under some kind of mind control, and probably did all the way up until that last panel on page 16 of #60. 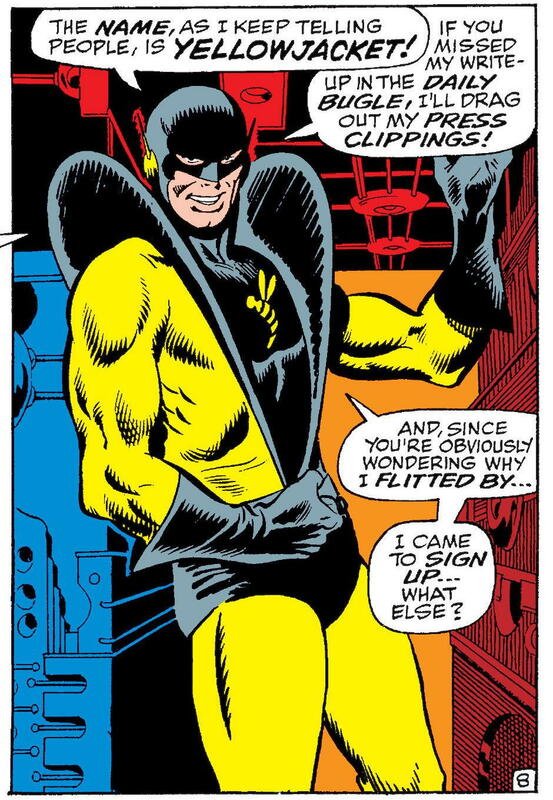 At any rate, if I was bright enough to figure out Yellowjacket’s secret before the big reveal, I have no recollection of it. 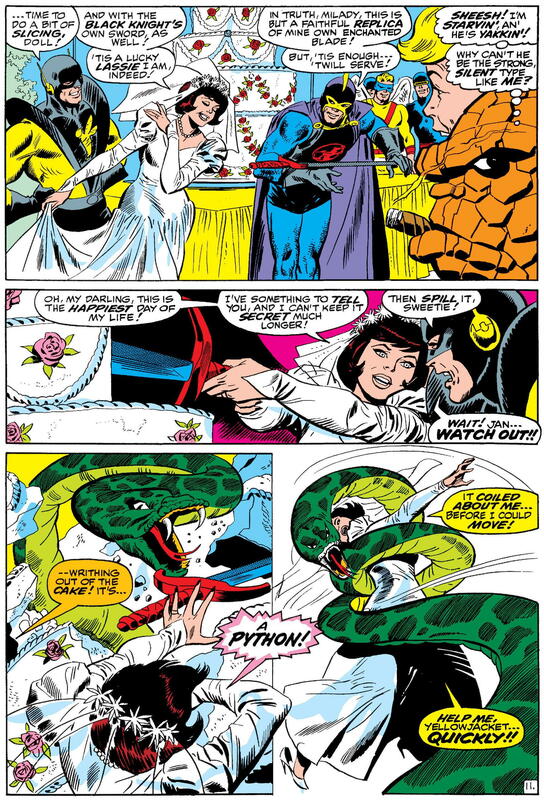 It’s nice (I guess) that, after relegating her to a passive, damsel-in-distresss role for much of this issue and the last, Thomas and Buscema allow Janet van Dyne to throw at least one satisfying punch before everything’s wrapped up. As for Hawkeye — who having finally freed himself from his bonds arrives just after the nick of time — his hapless ineffectualness here may seem to have been an arbitrary narrative choice, but it’ll be seen to bear meaningful fruit in just a couple of issues. But for now, our storytellers have still got a lot of ‘splaining left to do, and only one more page in which to do it — so pay close attention, OK? Got all that? 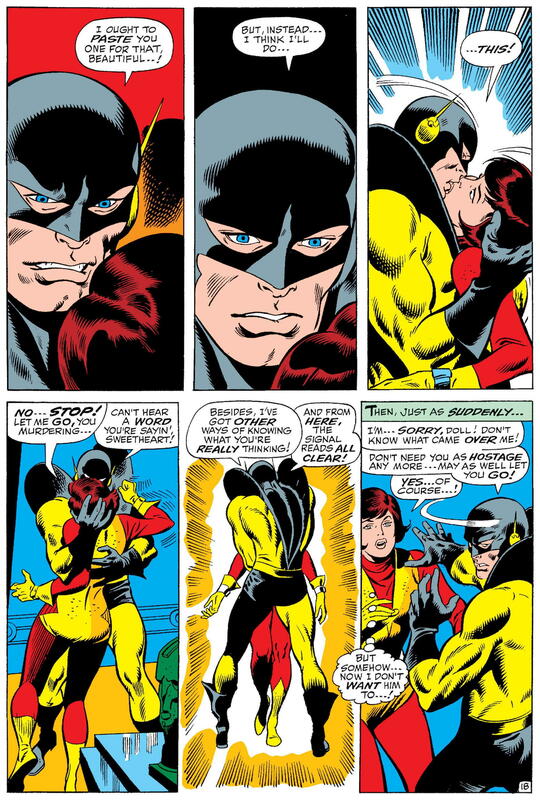 Due to his accidental exposure to “various untested gases“, Hank contracted a form of “schizophrenia” (actually, it seems to be more a case of dissociative identity disorder), which caused him to believe that he was an entirely different person, “in many ways the opposite of Hank Pym”. But Jan was ultimately able to figure out the truth, thanks to that nonconsensual kiss back on page 18 of issue #59. And rather than tell that truth to either Hank or their fellow Avengers — or, y’know, get her beloved some obviously much-needed medical help — Jan takes advantage of the situation to force Hank to do something he’s proven reluctant to do when in his right mind, i.e., marry her. Ain’t love grand? 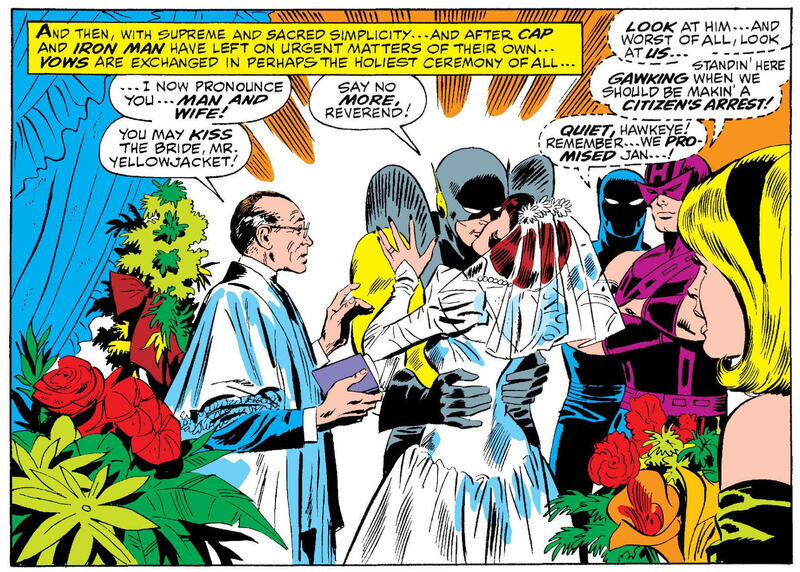 And hey, don’t worry, the marriage is totally legit — in spite of the fact that there’s no way Yellowjacket could have gotten a marriage license under his true, legal name. Well, not in our world, anyway. I guess maybe they do things a little differently in the Marvel Universe. But, despite my present-day self’s snark, I doubt that any of the problems noted above fazed me a single whit when I first read this story, back in late 1968. I was a reasonably well-off, sheltered, eleven-year-old kid who didn’t know much (if anything) about serious mental illness, let alone marriage law. 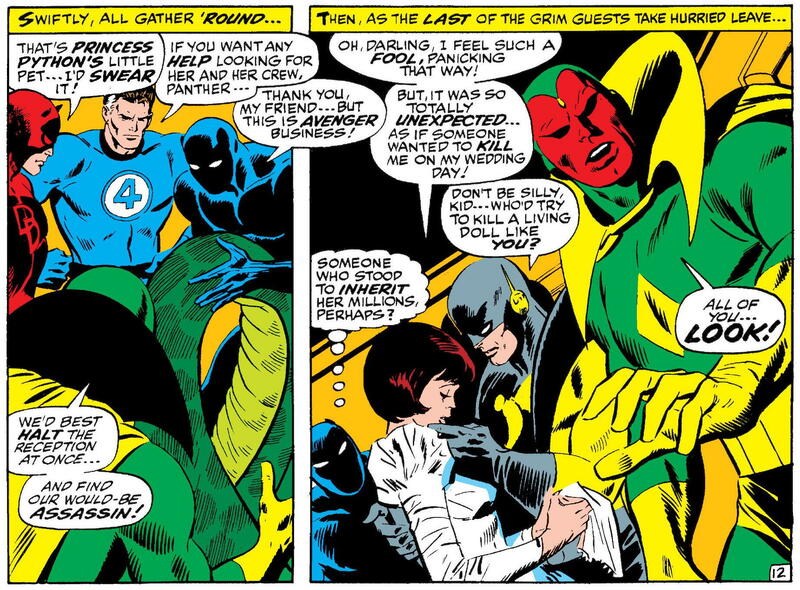 And as such, I took the happy ending that Thomas and Buscema provided on face value, just as the characters seemed to. And I supposed most other readers must have accepted it as well, since it remained in canon for decades without challenge (though not without consequence, as we’ll get into a little bit later). 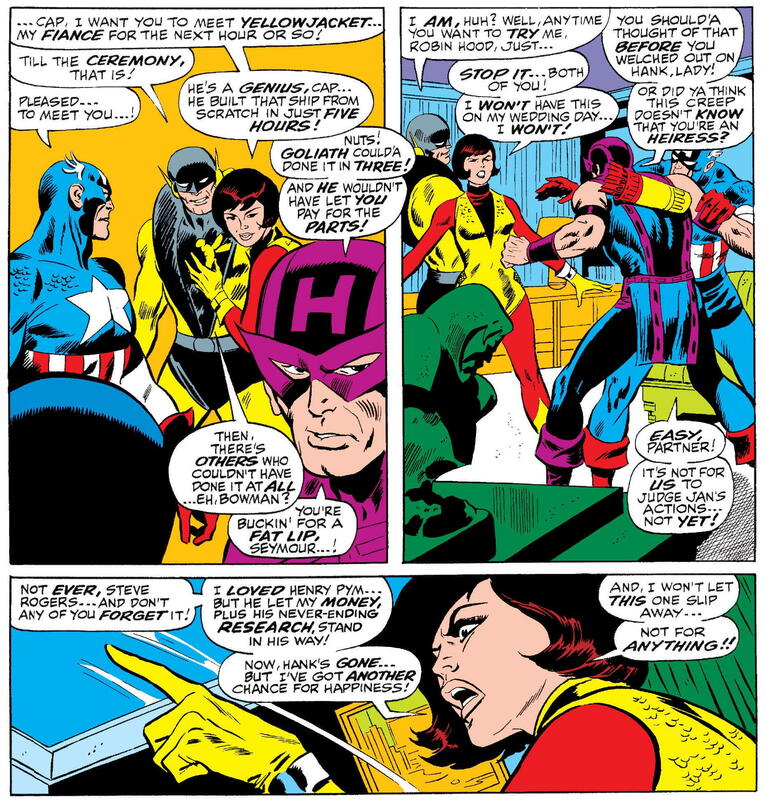 But many years before any writer thought to revise the story chronicled in Avengers #59-#60, its events were providing fodder for new stories, as well as new takes on the characters of Henry and Janet Pym. In 1981, then-Avengers writer Jim Shooter (who also happened to be Marvel’s editor-in-chief at the time) looked at the whole history of Hank Pym — paying special attention to such oddities as his regular cycling through costumed identities, his loss of memory after creating Ultron (which, as you may recall from our Avengers #58 post a couple of months back, took place immediately before the Yellowjacket dissociative identity episode), and, of course, the Yellowjacket episode itself — and decided that here was a guy who had some serious mental problems. Or, at least, someone who could be justifiably be written that way. 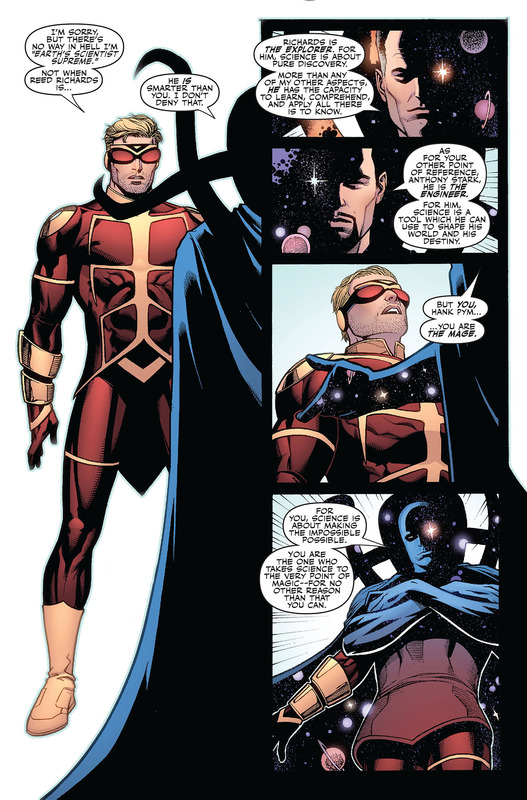 Shooter proceeded to put Hank through a full-on breakdown, during which the hero, facing a court-martial by his teammates over his behavior towards a defeated foe, schemed to secure his place with the Avengers by faking an attack on them by a robot he’d created, which he then would “defeat”. When Jan discovered his plan and tried to dissuade him, Hank struck her. 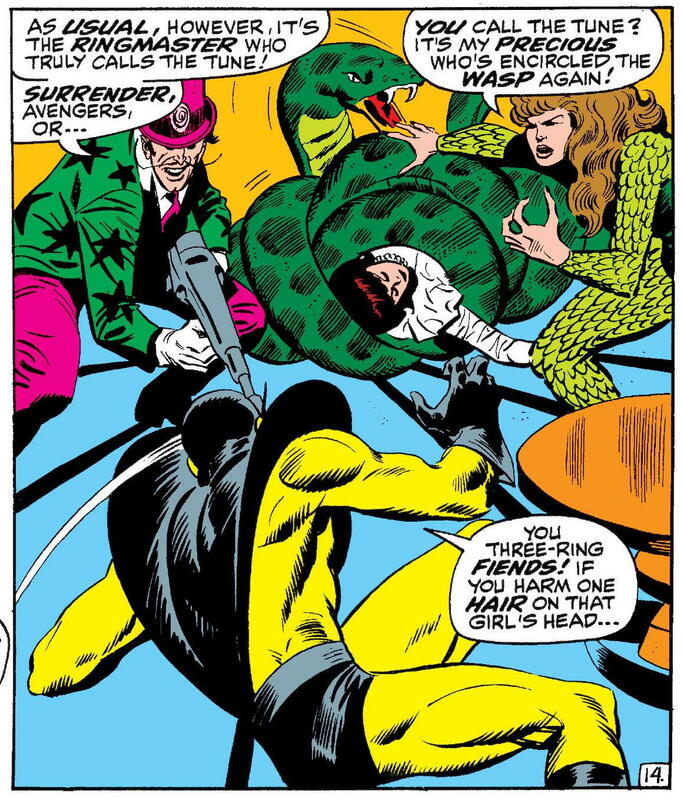 According to Shooter, he had written the scene in Avengers #213 so that the blow came as an accident, delivered as Yellowjacket flailed his arms in anger — but artist Bob Hall misinterpreted the script, and turned it into an obviously deliberate backhand. (You can read more about Shooter’s claim, and Hall’s essentially supportive response, here.) Regardless of any issues with that particular panel, however, Shooter had already written several scenes in which Hank was clearly emotionally abusive to Jan — making that single backhanded slap merely symptomatic of the problem, not the sole instance of it. In any event, by the end of Shooter’s storyline, the Pyms were no longer a married couple — and Hank would be fixed firmly in the collective mind of comics fandom as the Marvel Universe’s foremost spousal abuser. 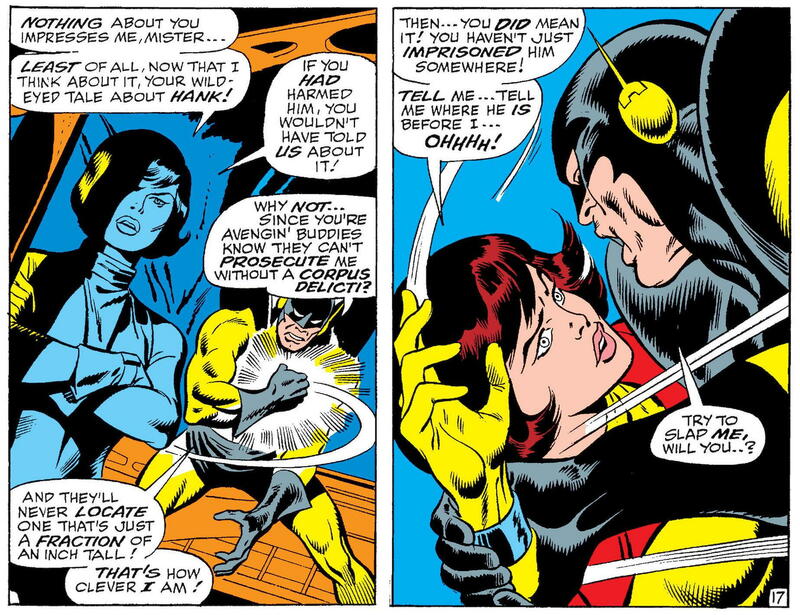 As Brevoort’s comment indicates, none of those attempts at rehabilitating Hank Pym have stuck, at least not for good. (Mark Millar‘s 2001 “Ultimate” version of the character, which went all in on Hank-as-abuser, certainly couldn’t have helped matters on that score — which is all I’m going to say about that subject.) Most recently, Hank has been utilized in a sort-of villainous role, having been fused with his “son” Ultron into a single malevolent entity*** — though, at the time of this writing, Hank’s psyche (or at least a fragment thereof) has been separated from his cybernetic progeny and trapped in Soul World, as part of Marvel’s 2018’s Infinity Wars event. That’s not a state of affairs that I would expect to last indefinitely, and I imagine that most of this blog’s readers would agree. We’re all but certain to see Hank Pym again, one of these days, and that day probably isn’t too far in the future. 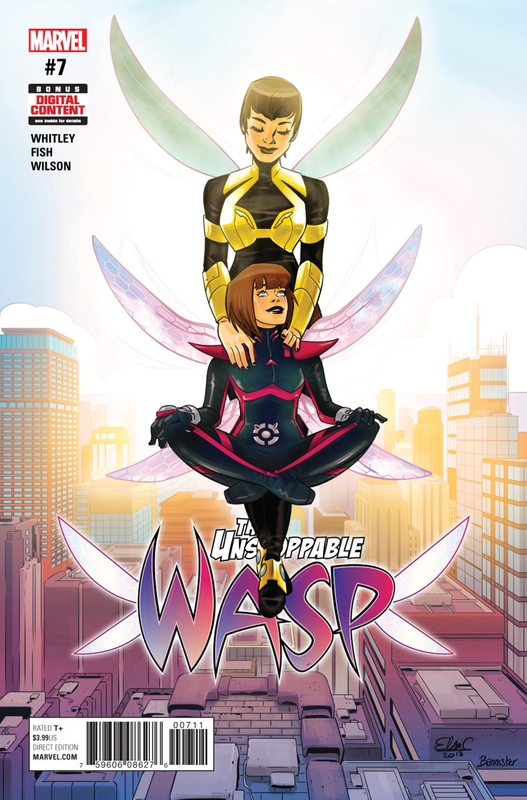 As for Janet van Dyne, the original Wasp — the former Mrs. Pym may fairly be said to have fared rather better than her ex-husband, in the years since 1981. 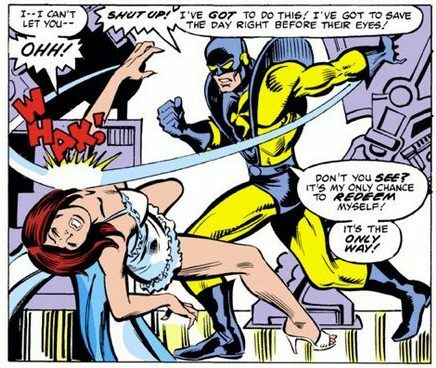 Having been originally conceived as a mere sidekick/love interest for Henry Pym in his Ant-Man identity, and characterized mostly as a flighty, flirty heiress with little interest in anything other than Hank (and maybe fashion; in the ’60s and ’70s, the Wasp was known for changing costumes at least as often as her partner changed identities), Jan came into her own post-divorce — taking on the chairpersonship of the Avengers in issue #217, and proceeding to lead the team capably through most of the next sixty issues. Over the years, she and Hank have put their past acrimony behind them, and even became romantically involved again a time or two, though never on a lasting basis Jan has been shown to have other romantic relationships from time to time as well; though, thankfully, following Hank, her characterization has no longer been defined by them. 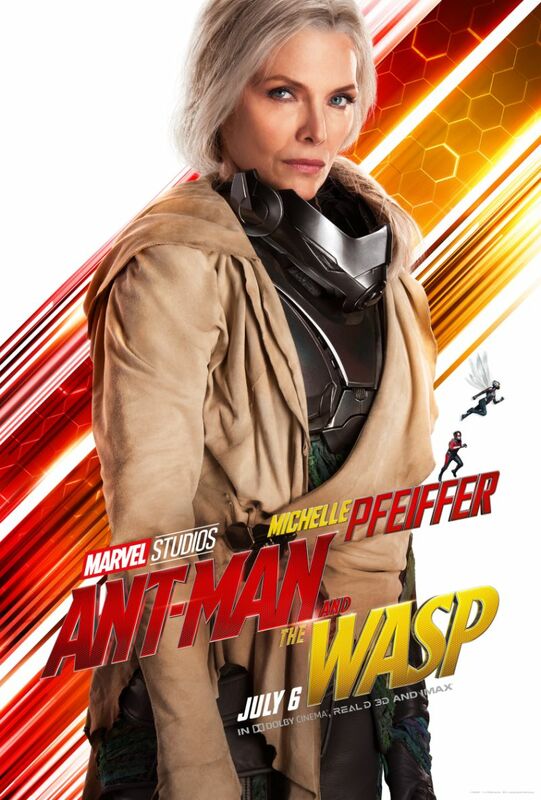 And that brings us up to date, more or less, with Hank Pym and Janet Van Dyne now established in the Marvel Cinematic Universe as well as in the comics, via the aforementioned films. Some fans of a certain age may be disappointed that Hank and Jan are not, in fact, the titular stars of Ant-Man and the Wasp, but others of us are just happy that they’re in it at all. Especially since neither dissociative personality disorder nor domestic violence seem to be part of either their past or their present, at least so far. Here’s hoping things stay that way. 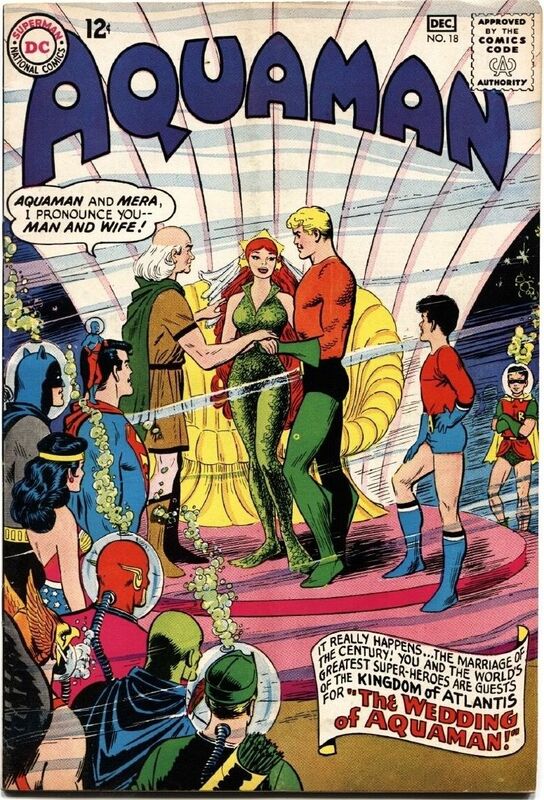 *For clarification’s sake, I’m talking here just about wedding comics where both parties involved are super-people — so the nuptials of Lois and Clark, pre-“One More Day” Peter and MJ, pre-Flashpoint Barry and Iris (and Wally and Linda), etc., etc., aren’t included. **The notable exceptions being Thor (whom a later footnote explains is off fighting the Silver Surfer in the latter’s book), the Silver Surfer (see previous), the Hulk (see Captain America #110), and the Sub-Mariner (whom I figure just didn’t get his invite in time, him living at the bottom of the sea and all). 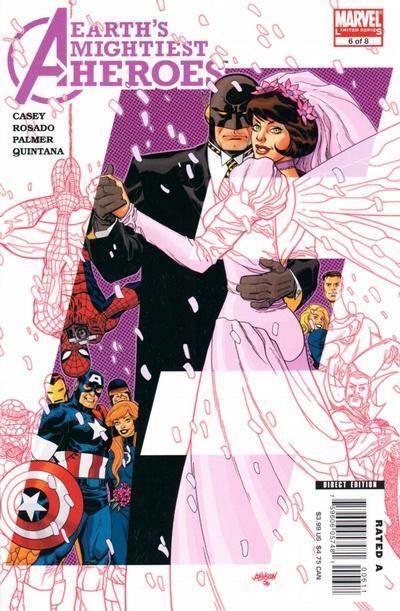 ***This post’s focus on Hank and Jan’s marriage doesn’t allow for anything like a full exploration of the Oedipally-charged drama of their extended (and mostly artificial) family — including Ultron, the Vision, Jocasta, Victor Mancha, and maybe even some other characters that I’ve forgotten. But I do expect we’ll get around to it in the blog, one of these days. This story got alluded to quite a bit in Avengers stories in the 1980s and 90s, but I didn’t have an opportunity to actually read i until the early 2000s when it was collected in Essential Avengers Vol 3. By then I was in my mid 20s and, yeah, the whole thing came across as insane. Going by your recollections, I’m sure that most young readers of Silver Age comic books probably didn’t find it all that odd, though. It’s not too much more bizarre than some of the really screwy plots that DC would do in the Superman books with Lois Lane trying to trick Superman into marrying her, and all the shenanigans with Jimmy Olsen, and all the screwy hoaxes the Legion pulled, and so on. 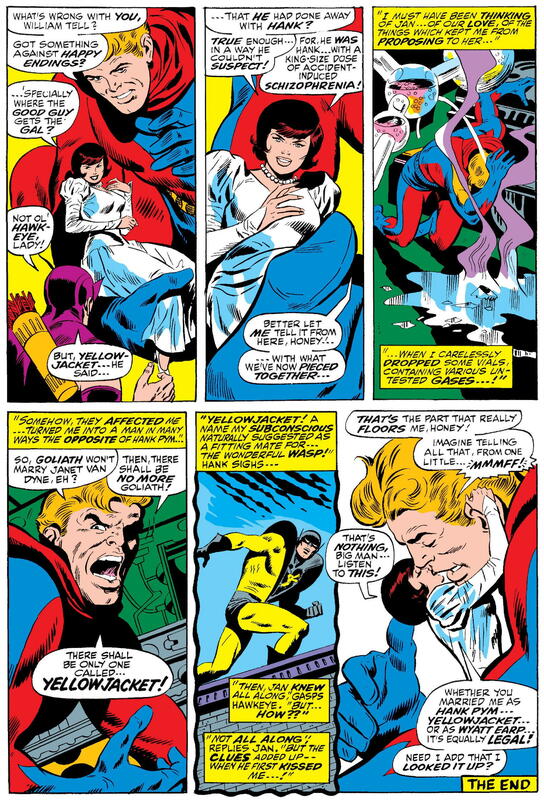 I guess one could argue that maybe it was a bad idea to take a story like this, originally written for readers in their early teens, and a couple of decades later attempt to apply real-world adult logic to it, which led to Hank Pym hereafter being regarded as mentally ill, irresponsible, and dangerous. 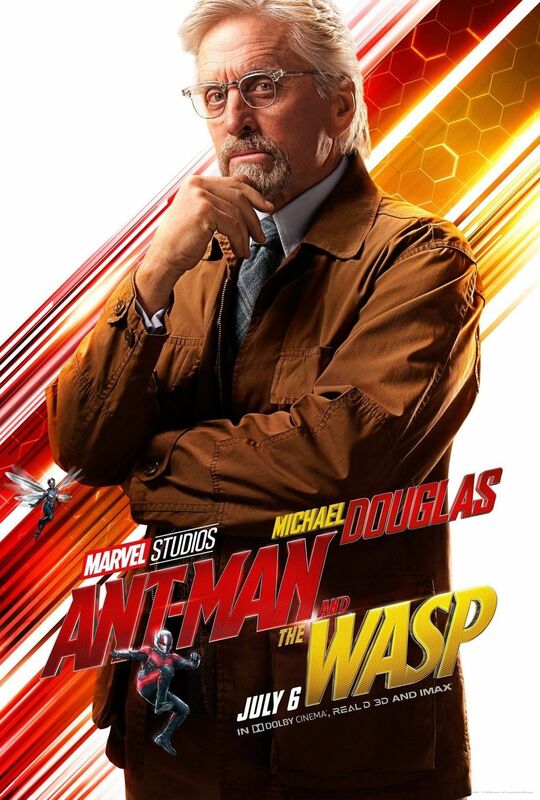 Still, if you’re going to forever have Hank be regarded as incredibly dysfunctional, at least getting Michael Douglas to portray him in the MCU is pretty darn cool, especially since he plays those types of roles so very well.